Click Here to play a recording of the seminar. Thank you Jennifer. And thanks for pulling it all together for this event. This is my first on-line seminar and I am really enjoying it so far. Thank you everyone for spending this hour with me. I do hope to hear from some of you at the end with questions. I’ll start with a brief introduction of who I am, and then we’ll get to the heart of the program: How to stay inspired and get new ideas. I am a painter, and have been painting for over 30 years – wow that sounds like a long time – but in that time I’ve also been exhibiting, teaching workshops and giving lectures. I have a BFA from Rhode Island School of Design, and an MFA from Columbia University. I lived in NYC for almost 10 years and am now in Santa Fe, New Mexico. That’s a picture of me working in my studio. As you can see in that picture I like to work standing, more like dancing around my paintings and have it set up so I can work on the wall, flat on the floor or table. You can also see that I like to work on several paintings at the same time. Anyway, that’s me and the cover of my new book Acrylic Innovation, that will be out next month. Some artists I know like to keep long studio hours pumping out quantities of work. In one workshop that I took with artist David True he said something that made me feel good about the fact that I have a different approach. He said he believed we as artists only have 4 good painting hours in us each day. If we keep painting after that we just reverse whatever we had accomplished up to then. I think we’re all different and so we all need to find what works best for each of us. I found that by having a life, living and enjoying a diversity of life’s experiences I am a happier person, better artist, with more to say in my work, and actually more productive in less time. Pictured here are some examples of my diverse art career. 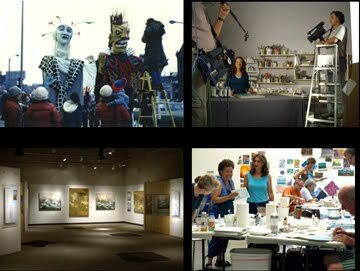 I spent several years running a puppet theater company where I learned how to create in a team, we made puppets, sets, costumes and performed together. I like to dance and spend time in ballet classes (sorry no pictures of me in tights) but because I like dance my puppets were mostly large scale body puppets. Moving clockwise to the top right there’s a picture of me in my studio with a film crew filming an instructional DVD, then of me teaching a workshop. On the bottom left, is a photo of my last exhibition at a museum in Phoenix. I like spending time in my studio, but also enjoy getting out in public and being with other artists. This diversity is also reflected in the variety of styles and mediums I like to work in. Here are three paintings of mine that vary in style and mediums. Some are more abstract, while some look more like a landscape. And here are 2 more. I like to work realistically, abstractly and combining the two. I like working with drawing materials like charcoal, and painting mediums like acrylic, oil paint, oil pastel, gold leaf, collage and mixed media. Not every artist likes such a broad sweep. What’s important is that you allow yourself to keep experimenting and playing enough to keep art FUN (that’s the key word) and exciting for yourself. …and so it is with our creativity. To keep the passion in our work we must keep the ideas flowing. I want to start with a premise that what makes a work of art great or powerful is when you as the artist can express your own magic, spirit, passion through your art. This usually happens naturally. When you make it a goal to copy or reproduce someone else’s art, even copying nature itself, that intent to replicate alone will restrict or restrain your expression coming through. When I talk about copying I am not referring to using reference material, like several photographs you might have on hand for a portrait. There’s a big difference between using a photograph as a reference and allowing yourself to exaggerage, shift and change it, verses copying it like a xerox machine. And if you restrict yourself to just copying you’re holding yourself back from being part of the work. When we have a desire to make something new it gets us motivated, out of bed in the morning, excited about what we’re doing and also implants that same excitement into the work. I can probably venture to say, then, that producing fresh work is generally our main concern or goal as artists. Therefore, change is one of our main tools. ring too. It will lose that spirit that special magic that comes from our excitement about something new. I feel as artists our biggest challenge is to consciously work against this innate hardwiring animal instinct that keeps us from enjoying and allowing change. By inviting change, and constantly renewing our passion for experimenting and new challenges, our work will take on this energy, the work will stand out, be noticed more. And this is especially important – to have the work stand out from the visual onslaught we all get in our everyday lives. The notion of how artists stay original, get ideas, self motivate is the main focus of my new, 2nd book, Acrylic Innovation. Instead of a textbook or scholarly version I wanted to create it as a handy artist’s resource. Several years ago I wrote Acrylic Revolution, a compilation of techniques with acrylic. I was trying to encourage artists to move away from copying so this became a resource for inventing techniques. It’s written like a recipe book, each page is a different technique. Since acrylic works well in layers I often paint by using a different technique for each layer, then the final result is surprising, something unique. With over 100 techniques in the book you can combine a few in any order and come up with a whole new look, something never seen before. I also made a DVD which shows this process where I create a painting from start to finish, using 10 of the techniques from the book each one used in a different layer. So Acrylic Revolution, my first book, is the recipe book of techniques. While my new book, Acrylic Innovation is a resource of ideas, styles, processes and then I couldn’t help myself, I added more techniques too. Both of these books and the DVD are an extension of how I work as an artist. I like variety and to keep growing and inventing. By the way, there’s a new magazine coming out called Acrylic Artist Magazine in Sept. and my work will be featured in it. Here are 5 ways to stay inspired. Let’s look at each one separately. But before we move on I want to mention something else about change. Its not helpful to feel pressured to have to change, or to make every work of art very different from your previous one. It’s simply about paying attention to how you feel. If you are on a roll, happy about what you are painting and cranking out paintings right and left, then why change it if it works. However, after awhile, even the best work you create gets old and when you notice feeling reluctant to get into the studio, or get out your brush, that’s the time to change something, and not just the subject matter. So these 5 items here are ways to reevaluate what you’re doing and figure out what needs to change at those times when you feel uninspired. If I find one way to get unblocked it might not work the next time, so it’s nice to have several ways or concepts of change up your sleeve. My new book is one resource, and/or keep a journal or file of thoughts for yourself on this. The first area we can look at is changing our style. We often spend years to develop a style that works for us, then often we are so entrenched in that it is hard to change. You can keep the same subject matter, say landscape, still life, portrait, abstract, whatever you like to paint, but change how it’s presented on the canvas. This is where style comes in. Here is the Table of Contents from Acrylic Innovation. The styles are grouped in terms of their perceived spatial qualities. Often styles are labeled by abstract or real, but here I am taking a different approach. The book spans a broad range from photorealism to minimal color field and everything in between. I even made up some style names. But lets talk a bit about the experience of space that a painting conveys. Just look at the first two images and picture yourself physically entering the painting. The experience of space is very different between the two. And also between say, the first and third images. I like to think about a painting as presenting to the viewer this experience of space. Some paintings, say from the Renaissance, are like viewing through a window, encouraging a feeling of deep space going back far into the picture plane. While other more contemporary works use texture, sheens and other methods to direct your attention to the front surface. The late author, teacher and painter Hans Hoffmann used a term called push-pull to refer to the combination of both types of spatial experiences, where the viewer is pushed towards the painting’s depth and pulled back out towards the front. There are 64 artists and their work represented in this book, all contemporary, working in acrylic, and working with a style that looks and feels unique. In addition to playing with different styles another way to reinspire is to try new techniques. So let’s say you like what you’re painting, and your style, but you just want to bring a feeling of play back into your work. Sometimes you get so skilled at what you are doing it gets boring. One of my friends is a very good draftsman – she can really draw! After years of drawing with her right hand (she’s right-handed) she started to lose the “edgy” feeling – it felt too slick for her, so she spent a year drawing and painting only using her left hand. Now that’s extreme – but it really gave her work and motivation a boost. New techniques are fun to try. Sometimes you can just take a break from what you are painting, take some time to paint something different, then go back to what you were doing and something has shifted. In other words everything you play with doesn’t have to become your new direction, it can just be a playful break. Here are 2 technique pages from the new book, Acrylic Innovation. Here’s a closer look at one of those techniques. This technique shows how to change a mood. Here I’m adding a romantic feel to the painting. In Image 1 you can see I have a painted landscape and the sky feels light airy and expansive compared to the dark ground. I like that there’s a contrast between the two, but I wanted to make them work better together, to integrate the sky and landscape or ground a bit more. So I mixed some very transparent glazes of earth tones, (there’s my palette in Image 2) and using a rag I apply these glazes to the edges to darken them. So there’s the finished example and it really made a visible different. Sort of holds the sky or the sky feels more contained, more intimate. Image 1 shows a painting that I was working on that felt too busy, too complex. I wanted to hone in on one form as a singular focal point. So image 2 I have masked off a shape that looks like a leaf, and Image 3 I’m using a spray of light and very transparent paint color. Then I remove the mask and the leaf really stands out. I softened the other forms pushing them back in space and pulling the leaf form forward. As a reminder if you like to experiment with new techniques my first book Acrylic Revolution is 100% about that. Here are 2 pages from that book. Here’s a close-up shot. This technique uses molding paste in 2 different consistencies – right out of the jar shown in step 1, and a diluted mixture with water in step 2 where in step 3 its splashed on creating an organic looking ground or surface. After it’s dry, paint color with lots of water is applied in Step 4 to enhance the surface texture. This is a very cool way to create an interesting background for a still life, landscape or portrait. Or you can use this technique in several repeated layers to create an underpainting or great jumpstart for an abstract work later building up color, shapes and forms. Trying new techniques can feel playful and often produce abstract looking imagery, but these are not limited to abstraction. New playful techniques can be used for visual effect in all types of styles and subject matter. I find it interesting when I go to museums that have old masters works in their collection. Some of those Renaissance paintings that appear at first glance to be super-real, when I go up close there are areas that I find in draped fabric, foreground garden areas, even hair that are very abstract. Here’s another example of a technique from Acrylic Revolution. I call this “hatched-line texture” so it starts with a wet layer of acrylic molding paste applied in step 1. Then using combs I create a linear pattern through the wet paste in step 2. This textural ground, when dry, is enhanced using watered down paint color in step 3, this part is just like the previous technique we saw. On the bottom right is a painting by a friend of mine Pat Forbes who uses this technique for her backgrounds, but instead of the blue wash or diluted paint color I used in the technique she works with washes of metallic paints to show off the line patterns. Many years ago I discovered something about my painting process that has really helped me tremendously. It started when someone asked me a question. They asked me if I go to my studio everyday or do I wait until I feel inspired to go. It got me thinking. My first response was to say that I go everyday anyway, no matter how I feel at first. Because I never know how I will feel later that day, and there are ways to jumpstart myself into working creatively. But it got me thinking about my process and how I felt at different times in my studio. I realized that for me there were 3 distinct phases Beginning, Continuing and Completing, and each phase required a different type of energy, a different approach and method, different techniques and attitudes. For me this was very empowering and I have been much more productive, and happier since I figured this out. Beginnings require an act of freedom, continuing requires acts of faith, and completion requires an act of healing. So, I go to my studio (almost) every day, regardless of how I feel. BUT, when I get to my studio, I decide what to work on depending on how I feel. Let’s say I am feeling very free, high energy, I want to try out new things, new experiments. I would be better off getting out some new canvases. The problem comes up for me when, lets say, I have several paintings almost finished. I might feel pressured to work on these instead, especially if one of my galleries is waiting impatiently for new work. If I force myself to work on these paintings that are almost finished and just needed small touches, I’ll most likely destroy them, or make wrong decisions and take away what was working already. So, I always have lots of extra canvases and surfaces around (even a stack of cardboard will do) and I may launch several to a dozen new underpaintings or start-up paintings in one day. In other words, I go to my studio every day but what I choose to work on that day depends on the type of creative energy I feel. my studio and get excited about the work that’s already in process there, and just want to get into a sort of meditative or hypnotic working state, and keep painting on those. That’s the second phase – continuing . In my studio I work on several at the same time, but when I’m not actually painting on them at the moment they are all turned around with the backs facing out so I can’t see the images. I’ll pick one of these to work on, and just focus my attention on that one particular painting. Then I can concentrate. This “continuing” phase has some challenges. Often the work has lost its initial surprise excitement, and hasn’t yet become something cohesive, so I just need to trust and have faith that by working on it one step at a time, one area at a time, it will start to move forward. So that’s my second phase. Let’s say in a typical two month period of time, for me, 60% of my painting days are spent doing beginnings (most of my energy loves fresh starts and new experiments), 35% of my days are spent doing the “continuing” part, and only 5% I work on finishing. That’s the last of the three, the completion phase. This takes a very particular type of energy. On these very valuable and rare days, I can see clearly what each painting needs to make it really work. I will give that last finishing touch to several on one day – finishing them all! Then I go out and celebrate. It’s more difficult for me to work on one painting continuously through all its cycles by itself. For me, having lots of other paintings to work on simultaneously takes the “attachment” factor out of working on just one. And then I can put my energy to its best use. When I have a commission to paint, I WILL paint it all the way through, but still take breaks to play on some other ones to keep the juices flowing. I find it easiest to work on one cycle for the whole day, and not switch. For instance if I spend several hours flinging paint in a freedom engaged session of “starts” I will not be as adept on that same day to try to finish a painting or two. So basically, understanding how much energy flows and paying attention to how I feel I can choose the most productive way to work that day. We can gain alot from looking at other artists processes and here is a spread from the new book Acrylic Innovation. We previously looked at techniques from this book but in addition to techniques this book features contemporary acrylic painters offering their processes, ways they stay motivated, and how they developed their particular unique style. Here is Jylian Gustlin from California. You can see on the right an example of one of her paintings and she is in her studio painting on the left. It was really important to me to show the artists in their sutdios to see the variety of set-ups, spaces and ways of working. Jylian uses the figure as a main focus in her work, but distilled in such a way to produce what grabs me as compelling imagery. In the text I share her artistic process, other artists who inspire her, and other artists who work in this type of style. Then I include variations or ways to use the figure to get different results. Here is another artist in the book, Daniel Smith from Montana, who shared his intriguing stories of how he gets his animal reference material. This photorealistic painting of an elephant and two lionesses is used from several photos that Daniel photographed on a trip to Africa. I was glued to my seat when he told me about the lionesses charging his jeep. The dust in the background was invented by Daniel to emphasize the animals. I like how he uses photographs but invents his own composition and space to move away from the tell-tale camera curve produced by camera lenses. This has a photographic look to it but it would be hard if not impossible to get a shot like this from a camera. Here is Sherry Loehr who lives in California but just had a show of her work in my hometown Santa Fe a few weeks ago, and I got to meet her in person. Her paintings are magnificent. I love how she combines a real classic still life with abstract backgrounds. She uses many of the playful techniques I list in my books and these add a real contemporary flavor to her still lifes. Now that I think about it writing this book was my way of reinspiring myself. Talking and meeting 64 artists whose work I found daring, inspiring, and different will no doubt fuel me for years. And that’s what I’m hoping this book will do for you and your work. Also forming a critique group or artist group will provide lots of feedback and support. Taking workshops from instructors you like and admire. Visiting galleries and reading books are all ways to get inspired by other artists. y ideas in a row before one in particular strikes me and I just have to do it. The rest I don’t bother to take action on. And speaking of non-art activities, the topic that comes up most often with my artist friends and colleagues is how much time artists now need to spend doing the business aspects of our career: photographing, inventorying and digitalizing our paintings for the galleries that represent us or our own website. Then there’s blogs, showing up at openings, price lists, framing….the list goes on and on. This business or career part of art making is optional. There’s nothing wrong with painting for pure pleasure and our own need for experimenting and inventing. Sometimes we feel an unnecessary pressure from family and friends to make a living at it. I like to think of art making and the career part as separate activities, with the career part optional. There is a great deal of satisfaction we get as artists, though, to show our work. I believe that art is a form of communication, and that we really do want to communicate. There are so many ways of showing our work without pressure, such as having a party, tea or dinner and inviting friends for fun to show our work. For those of us that do want to make a living with our work, it’s important to balance the business aspect with art making. Find your best time to paint and keep that time unscheduled for painting. Make a commitment during that time by turning phones off and other potential distractions like hanging a do-not-disturb sign on the door. What’s helped me the most is a decision I made to make the business part of art as fun as painting. If I am bored I change my business plan or process. Sometimes galleries can add pressure to keep you from changing your work, as they like consistency which helps them market and sell your work. As I am working on new work I like to invite my agents to my studio so they can gradually get used to the change in the work. My work and my ability to keep changing, though, is priority, so if they don’t like the new change in my work I’ll change galleries. Basically I make a commitment to myself to keep life fun, interesting, and allow myself opportunities to keep growing as a person and artist. By the way, here is a picture of a puppet show I did for friends – it took several months to create – and the show makes fun of the business part of art. It really helped me get a better attitude about the business aspects. There’s a clip on my website of the whole show if you want to see it. So I will stop now so we have time for questions. Really enjoyed the presentation Nancy. Adding your new book to my Christmas list! Do you think you'll ever make a trip up to the great white north (say, Edmonton Alberta?) to speak? Nancy your art and blog are inspiring, thanks and congrats. I completely agree about your suggestions for getting inspired in order to produce fresh work. One of the things you didn't mention however is trying new things outside of your art (which may or may not be relevant to your book direction). Just like using a different medium influences what you produce, so do the things you engage in on a regular basis. I find that when I try new things it tends to get the creative juices flowing. Even where you live or vacation has a profound impact on what type of work you produce. When I was living in Phoenix I produced brightly colored very organic pieces, whereas now living in the Bay Area I find myself drawn to a very different palette.